Aspen, CO ColoradoOne Month. Seven peaks.Snowmass extreme skier Chris Davenport’s quest to climb and ski all 54 of Colorado’s fourteeners in one calendar year has reached its final stretch. He officially launched his mission Jan. 22 with a descent of Mount Lincoln’s Putnam Gulch. Today, with one month remaining before the one-year anniversary of his Lincoln climb and ski, seven peaks remain – Crestone Needle and Humboldt, Blanca and Little Bear peaks in the Sangre de Cristos, mounts Shavano and Princeton in the Sawatch, and Longs Peak on the Front Range.On Dec. 13, from his perch on the 14,165-foot summit of Kit Carson Peak, Davenport had the ideal vantage point of a few of the remaining hurdles. To the north, the Crestone Needle cast an imposing, jagged outline against the clear blue sky. The face of Blanca Peak, nearly 40 miles to the south, was visible with a pair of binoculars.Although he admitted on the project’s website that he is feeling self-imposed pressure to complete the project, Davenport said Wednesday he isn’t concerned about the peaks ahead, or finishing before Jan. 22. He is consumed by how far he’s already been. 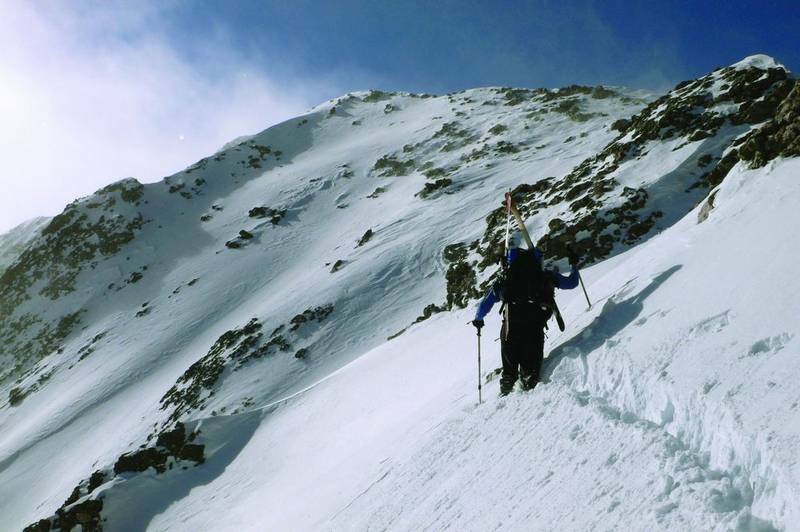 Davenport is no stranger to completing multiple fourteeners in a short period of time: He skied 20 peaks from April 4 to May 4, including 14 in 14 days. On May 4, he tackled three peaks – Mount Wilson, El Diente and Wilson Peak – in a grueling 15 1/2-hour trek that covered 8,500 vertical feet on both the ascent and descent.He acknowledged, however, a stark contrast between conditions in early spring and those in December in January. Davenport climbed just two peaks this fall.”It’s hard to compare anything to the momentum we had last spring,” he said. “There were long days and safe snow conditions. Winter is a much different game.”Unseasonably cold, dry and windy conditions forced Davenport to delay the start of his project for three weeks in January. He bypassed the peaks he has yet to climb – most are in the southern part of the state – because they never had adequate snow cover, he said. Mother Nature ultimately will determine his fate. Recent weather has been encouraging. A snowstorm this week dumped nearly three feet of snow on some southern Colorado slopes. Little Bear, Humboldt Peak and Blanca, which Davenport deemed undoable little more than a week ago, should now be in good condition, he said.He’s in no rush.”There’s a lot of new snow out there, so I have to get out and take a look at things,” he said. “This isn’t all about skiing, it’s about safety, and I approach things from a conservative point of view.”The plan is to attempt Mount Princeton, which Davenport deemed the easiest and least dangerous of the remaining peaks, today, he said. Davenport said he’s fully prepared to delay the project if avalanche danger persists.